The friendly staff at Chicagoland Pain Management Institute welcomes your call and looks forward to serving you. If you have any questions about our pain management services, please call our office in Bolingbrook, IL at (630) 312-4505 or in Hinsdale, IL at (630) 856-6825 or use our secure online appointment request form. 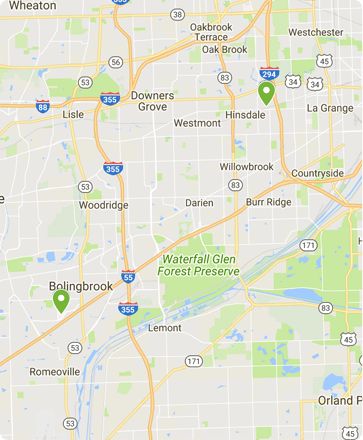 We have two convenient locations in Hinsdale and Bolingbrook, Illinois to better serve you. Each of our locations, located within an AMITA Adventist Medical Center campus, offers ample free parking and easy access. In the event of a life-threatening medical emergency, call emergency medical services at 911 immediately. DO NOT WAIT! Inform the emergency room staff that you are a patient of Chicagoland Pain Management and they will contact us if needed. Please be sure to also call our office again during business hours. Bring your previous medical records and imaging studies, along with a comprehensive list of your medications, to ensure that our team has all the necessary information to formulate a treatment plan that is best for you. We urge you to bring any questions or concerns you may have regarding your medical condition. By being prepared for your initial visit, we can promptly and appropriately start a treatment algorithm that will help you recover from your chronic pain. To provide for your pain management needs, our office accepts a variety of HMOs, PPOs, Medicare, and other health plans. It is your responsibility to ensure that we are in your insurance network prior to your visit. Being out of network may cause you to have a higher co-insurance payment or your visit may not be covered at all. Please contact your insurance company or you may call our office to find out if we accept your plan. If you have a question related to your bill or insurance, please contact our billing specialists at (630) 312-4505. Chicagoland Pain Management accepts new patients with or without referrals, according to your healthcare insurance plan. Patients with an HMO insurance plan are required to obtain a referral from your primary care physician. The referral must be obtained before you can be seen for an office visit. Please coordinate this with your primary care physician in advance. Appointments will be rescheduled if the referral is not received in our office by the time of your visit. Chicagoland Pain Management’s doctors have hospital affiliations with AMITA Adventist Medical Center Bolingbrook and AMITA Adventist Medical Center Hinsdale. If you are admitted to a hospital, please let staff members know that you’re a patient of Chicagoland Pain Management Institute. If for any reason you cannot keep a scheduled appointment or will be delayed, please call our office as soon as possible. Charges may be incurred for appointments cancelled less than 24 hours before the scheduled appointment time.